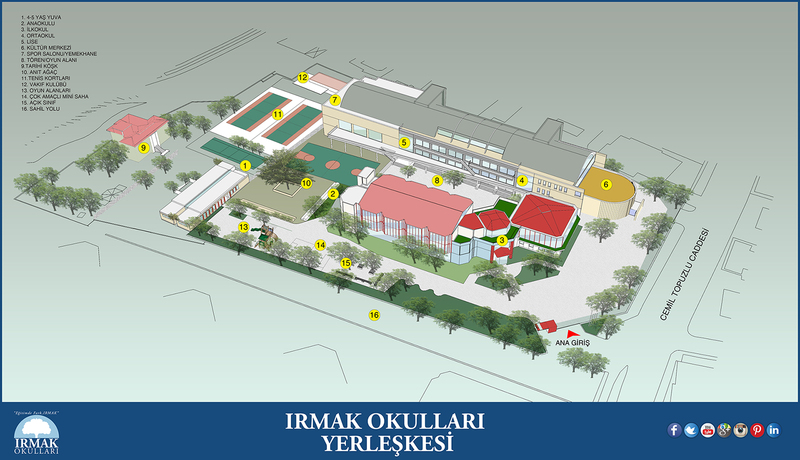 Irmak Schools High School Foreign Language Department aims for the students to be able to learn English by using critical thinking, reading, writing, listening ang speaking skills along with either French, German or Spanish as a secondary language. The main target of English language teaching at Irmak Schools is to cultivate a youth that is able to use English fluently both written and orally, able to read a variety of classical and contemporary text, creative and able to exhibit critical thinking skills. To create a free and safe learning environment for all the students to feel comfortably safe. To enable the students to be more aware and respectful of and towards themselves, others as well as other cultures. To engrain the students in reading and help them turn this habit into a liefelong activity by internalising. To create environments where the students can exhibit their creativity. Enable the students to read and analyse various written texts. To encourage and guide the students to take national exams such as (YGS, LYS) or international ones such as FCE, TOEFL, SAT, FIT or DELF and help them prepare for these tests. Our school bases its foreign language curriculum on COMMON EUROPEAN FRAMEWORK FOR LANGUAGE LEARNING (C.E.F.) and Communicative Approach as a modern method of teaching. While emphasising grammar knowledge in acquiring a foreign language, the fundamental principle is for the student to be aware of where and how they can utilise this information through practical learning. The student perceives language training as a whole, and extracts the rules from within. The tools and materials prepared for use in the language training classrooms are prepared with oral, audio and tactual intelligence in original or near to original formats. (such as TV, radio programs, magazines,newspapers) social situations are realised through applications and activities in the classroom where the students can use their foreign language skills. The teacher’s main role is to prepare and guide their students for such real situations and preparing the materials. Students find the opportunity to utilise their foreign language skills as a tool under different circumstances, and express their feelings and thoughts. The students are encouraged to make mistakes when using the language in order to further develop their writing and speaking productivity. Have sufficient knowledge of those countries who speak English officially or as mother tongue. Acquire information on the religious and national festivities, traditions, political past, music, art, literature and fashion, of the countries mentioned in the textbooks. Read fictional contemporary novels ( The Outsiders), contemporary plays, novels written in English by writers from various different cultural backgrounds, (such as Animal Farm), mythological Greek and Roman stories (such as Persephone In Hell, Pandora’s Box) nonfictional texts and articles covering social and economic topics, essays, biographies and autobiographies. Are able to recognise and use text types such as articles, report, story, fiction. Read at least 2 novels per year and 2 plays throughout their entire English language traning at Irmak. Watch TV channels broadcasting in English for various films, documentaries, quiz or reality shows etc. Listening Comprehension: Able to understand long conversations where there is unclear contsruction or undefined relations, but implied. Understands TV programmes and films without much difficulty. Reading Comprehension: Able to read substantial literature texts in any expertise, and regards differences in style. Understands long technical information, even if it is not a matter of interest. Interactive conversation: Able to express oneself naturally without much need to pause for words. Able to use language in a flexible and effective manner for social and professional goals. Able to express thoughts and ideas in a clear and concise manner which corresponds to others dialogues. Oral presentation: Able to express complex topics, in a clear and detailed way, by developing certain ideas in relation to the result by incorporating subthemes. Written presentation: Able to express own ideas through clear constructed text. Able to produce a letter, written statement or a report on complex topics where issues important to him/her can be stressed. Able to decide on the most suitable format for the targeted reader. This page was created on 8.2.2017 11:43:41 and has been visited 1202 times.